The girls as humans. রামধনু Dash, Fluttershy, Rarity, Pinkie Pie, Twilight Sparkle and applejack as humans in anime.. HD Wallpaper and background images in the মাই লিটল পনি ফ্রেন্ডশিপ ইজ ম্যাজিক club tagged: my little pony friendship is magic my little pony humans anime. 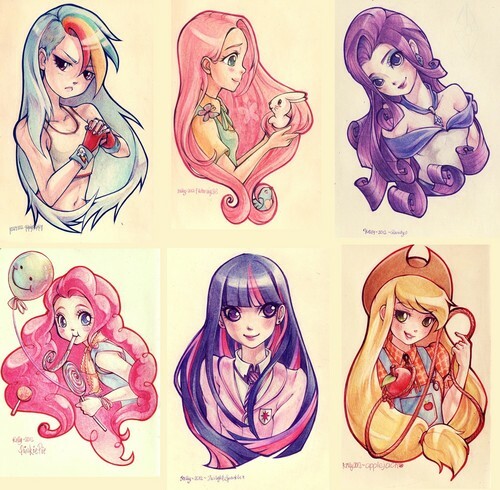 রামধনু Dash, Fluttershy, Rarity, Pinkie Pie, Twilight Sparkle and applejack as humans in anime. Soooo cute but why do they ALL have long hair!? ^ Long hair is always better. The only one that may look right with short hair would be Rainbow Dash, anyway. rainbow dash is like "booya dude bring it!" RD is just like, YOU WANNA MESS WITH ME,BRO! BRING IT! Brilliant I love Rainbow Dash's expression. Totally cool I wish season 4 would start and not MLP Equestria Girls. I mean saying everpony would not make sense , right ? Much better than the Equestria Girls, especially Applejack and Rarity. Amazing, much better than how they look in Equestria Girls. Fluttershy: Angel, you really shouldn't pick a fight with Rainbow. It's not good for your health. Angel(Thinking): I'm going to smile and nod until you are no longer paying attention. Pinkie: ITS TIME FOR A PARTY!!!!!! Applejack: I just got a new lasso! Pinkie: That's why we're having a party! Awesome. They all look so pretty. I think Rainbow Dash would look better if her hair was shorter, though. Rarity hair's looks a teeny bit weird. It's still amazing.